We recently had the pleasure of meeting illustrator and author, Emily Martin at GreenBean Books in Portland, OR. We've admired her artwork and were delighted when she began publishing children's books. Dream Animals is a companion book to her brand new release, Day Dreamers. Both are beautifully illustrated with fantastical creatures doing magical things. 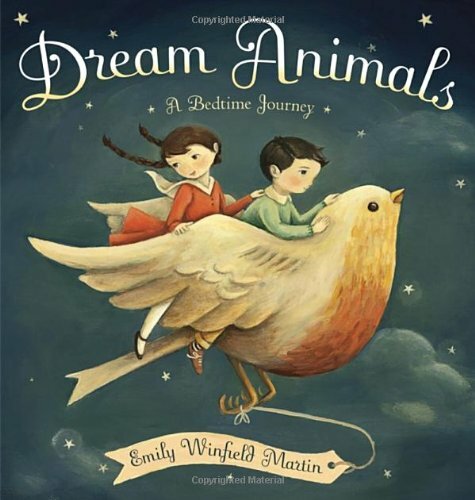 Emily Martin's illustrations inspired us to create our own versions of dream animals. Can you imagine your dream animal? Does it wear silly hats, have wings or play baseball? Find pictures of animal heads in magazines or old books. Ranger Rick Jr. magazines have great animal photos to choose from. Paste your inspiration on a blank piece of paper and start drawing.